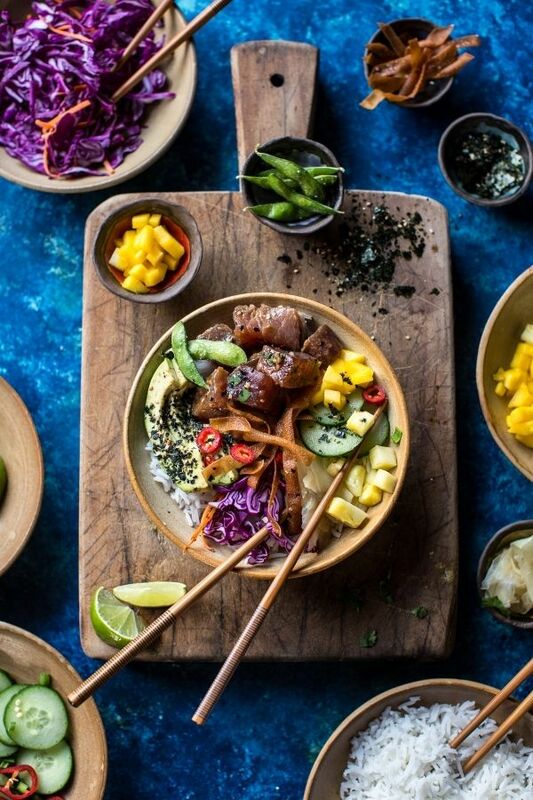 Get adventurous with these Poke Bowl recipes: Making the latest food trend family-friendly. By now you know that we’re all about keeping it real. Like making dinners that honestly take 30 minutes-real, using pretzels to get the kids interested in dinner-real, and microwaving veggies-real. Parenting can be noisy, messy, crazy, adventurous, imperfect and fun, and we see food the same way. 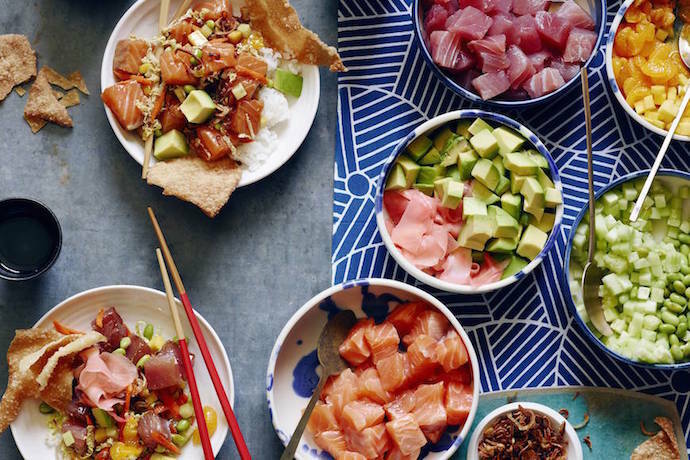 So while it’s not often that you’ll come to Cool Mom Eats and see raw fish on the menu, this one’s for those of you with adventurous kids, ready to try something like a poke bowl recipe. Hey, it could be just what you need to earn a few bragging rights about your kids and mealtime. 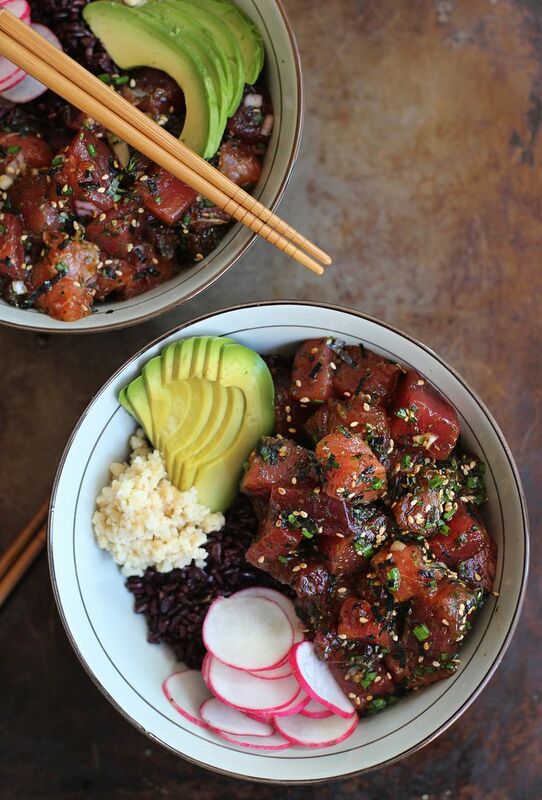 Poke bowls are a hip, new food trend (and a virtually no-cook meal—woot!) that I think can carry over to the family dinner table, especially if your kids already like sushi. 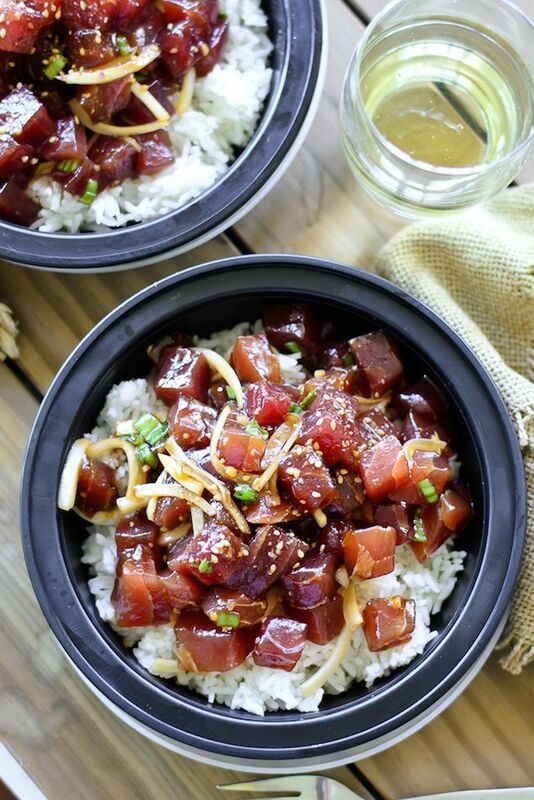 A traditional Hawaiian raw fish salad served over rice, poke (poh-kay) is traditionally made with raw ahi tuna—sushi grade, of course—but can be made with whatever raw fish you like best. The marinade is usually simple, and there are so many kid-friendly fixings you can service. Being that poke is so customizable, the main key to making poke family-friendly is making sure you start with safe fish. Can kids eat the raw fish in Poke Bowls? Depending on where you live and, more importantly, the quality of fish available to you, I’ve seen the recommended age for first serving raw fish to children range from around 3, to as late as six-years-old. The US FDA basically says, get past the toddler stage. Also, if you didn’t already figure it, this is definitely not an everyday meal. You can totally serve raw tuna once a week to kids but not much more because of the potential for inflated mercury levels. That said, cooking it does not change mercury content so “raw” is not an issue if your kids are already eating canned tuna. Where to get the best fish. No matter how old your eaters, it’s of utmost importance to buy sushi-grade fish, and that means most likely, not shopping at a regular supermarket. Only buy fish that’s actually labeled “sushi grade” from a trusted fishmonger. We’re being careful to make sure that you get the best—and safest—experience, but don’t be scared. Just like any other animal protein, chosen well and safely handled, raw fish can be healthy and delicious. So many nutrients! And if the kids end up disagreeing on the delicious part, well, that’s why this is such a family friendly meal. Just leave the fish out, and kids can still enjoy a big bowl of rice with fixings like edamame, cucumber, and wonton crisps, while you dive into your delicious bowl of poke. 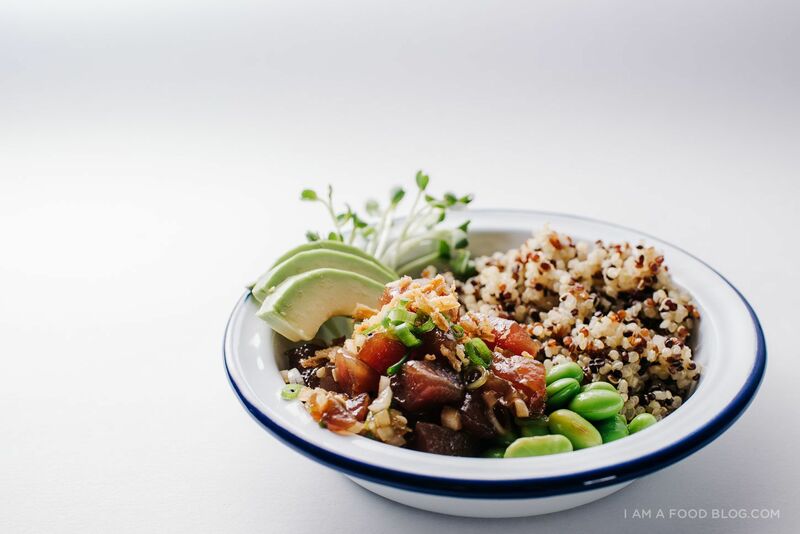 If trying poke is adventurous enough for you and your family, you can keep it simple with this Soy Sauce Ahi Poke Bowl at Honest Cooking. Consider it a gateway poke recipe? If your family ends up loving this, you can look at the other recipes for additional add-in’s that get more adventurous with each new try. Baby steps. If the soy sauce version of the recipe above was too simple, but you don’t want to go too crazy, this is your recipe. The Ahi Poke Bowl at Honestly Yum is fairly traditional, but also very easy. With some seaweed and macadamia nuts mixed in, it strikes a lovely balance. I love this Hawaiian Ahi Tuna Poke Bowl at Half Baked Harvest because pineapple and mango. So good! And that tropical fruit flavor makes so many things go down easier for kids. You’ll love it because it’s quick and the site even offers a video tutorial. Fear not working with raw fish: Tieghan has you covered. Ready to jump in with fresh twists on poke? This Ahi Poke Quinoa Bowl at i am food blog is on the top of my to-make list. With all that protein-rich quinoa, plus avocado and edamame, there’s plenty of healthy goodness to make this a complete, one-bowl meal. Leave it to Gaby of What’s Gaby Cooking to make poke extra fun! 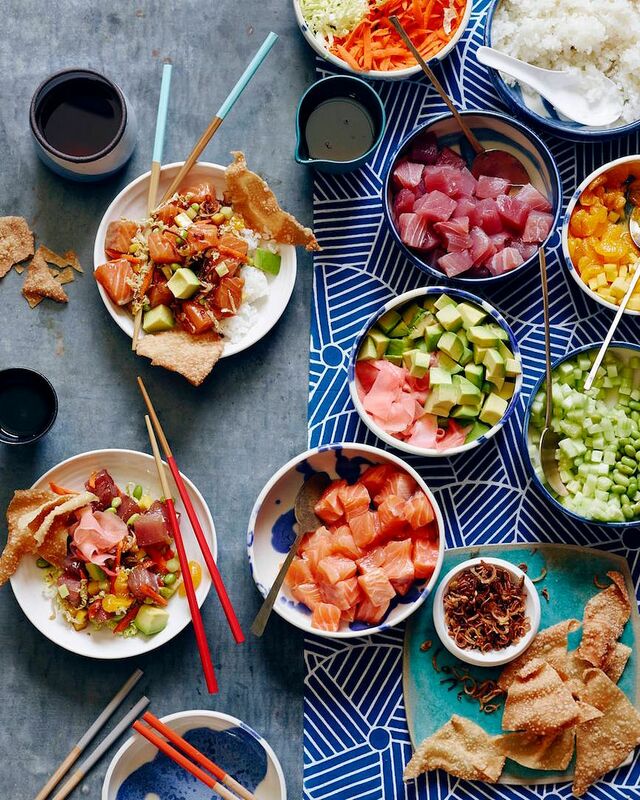 If your kids like make-your-own dinners as much as mine do, they’ll love these DIY Poke Bowls. (Also at very top) Or, at least, it might make them more likely to give it a try. worst case scenario, they’ve got a bowl of rice, avocado, edamame and cucumber. Edited to add: CME writer Caroline recently made poke bowls for dinner and, though it turns out totally delicious, she noted that most of these recipes call for fish that were going for a whopping $26/pound in her area. Whoa! Instead, she substituted more affordable, sushi-grade salmon which worked out great. Consider doing the same if you live somewhere where tuna is super expensive these days.